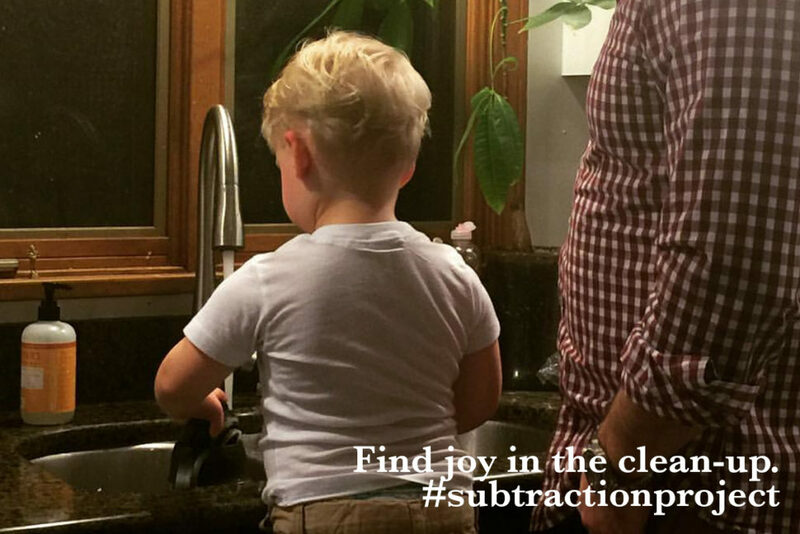 I was watching Braeden play in the sink tonight, “cleaning-up” in his own little way, and breathing in the joy of his play and it reminded me of a lesson I’ve been learning (again and again) about finding joy in the clean-up. Many people will be starting the clean-up of their lives in these next few days. We’ll tackle things with gusto and say things like “2017 is the year I’ll finally do it” and I love that good energy and the momentum that the new year can kickstart. The thing I most want to do this year is to find the joy in this clean-up, to look for it and discover it along the journey; subtracting the slog and the unnecessary hardship we make ourselves endure in the process of living these lives. Finding my favorite mittens instead of settling for the ones that were on the top of the pile or none at all. Warmer hands, a sense of accomplishment and in the hunt I found a scarf I ended up really grateful for wearing too. Put lemon in my water. It doesn’t transform it into wine, it involves just a tiny intentional choice to add the lemon and it makes drinking water more than 2% more enjoyable. Que up a podcast while doing a chore I don’t particularly enjoy: folding the laundry or putting away the groceries. It takes an extra minute but it makes ALL the minutes of doing the task way more enjoyable. I had been so focused on getting it over with that I lost sight of the value of the time that I was giving it. Over-share alert but one I think busy women are guilty of and one that I realized I was doing a lot: I’m not holding it. When I recognize I have to pee I go to the bathroom, I’m not holding it while I try to fold that load of laundry or run that errand. It’s dry in upstate NY and the winter has many months to go – I added a few drops of lavender essential oil to the coconut oil jar beside my bed to make my before bed lotioning session a bit more relaxing. Stopped trying new vinegar types for salad dressing. I love rice wine vinegar – it is by far my favorite and I had this idea that I needed to have variety and while that may be true one day the 2% improvement today is recognizing that I have a favorite and enjoying it without apologies or feelings of boredom that I do not have. You may feel that way about your t-shirt, or your breakfast, or how you like your coffee or a million other things. 2% improvement means enjoying something I love completely without looking for the next best thing. Taking in the people I love with our hellos and goodbyes. We’re busy, everyone is and in the hustle and bustle of the end of the year I did a lot of going through the motions. 2% improvement here has me looking and admiring the people I love as I say hello to them and goodbye to them, making eye contact, complimenting their choice of smile or clothing, giving them the real two armed hug and not the assembly line one. So my question for you is in your own clean-up efforts, in the things you hope to feel and do in 2017, what would be your 2% improvement to that place? Want some accountability? Share it with our community on Facebook here. You have all the days in front of you. 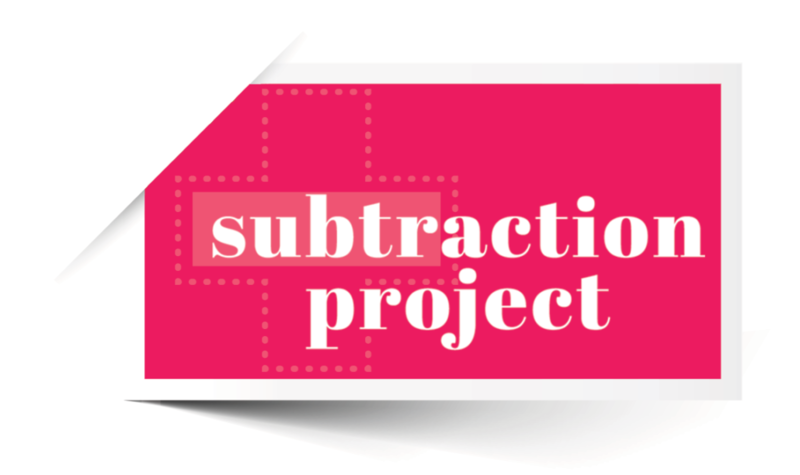 Subtract the idea that you have to make this process hard on you and seek the joy with me.